Nagaur cattle Fair is held from 6th to 9th February 2014. This fair is held every year during the month of January - February, is popularly known as the cattle fair and is the second largest in Rajasthan. 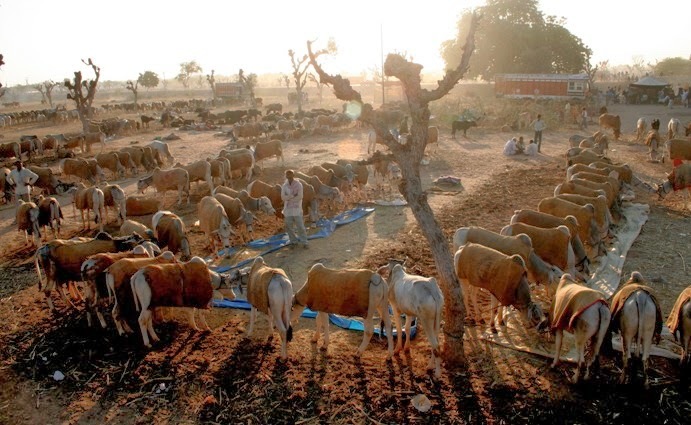 Nagaur Town becomes a sea of animals, trading over 70,000 bullocks, camels and horses every year. The bullocks are known for their fleetness. Not only are the animals lavishly decorated, even their owners flaunt their colorful turbans and long mustaches. From shearing sheep to handsome marwari horses to spices all compiled in one fair. Attractions include the ‘mirchi’ bazaar (largest red chilly market of India), wooden items, iron-crafts and camel leather accessories. However it is just not the number factor for which this fair has risen into popularity. It is also about the quality of the cattle that has earned it a special reputation. In the Nagaur's Cattle Fair all the cattle are beautifully decorated. These are spotted boasting fascinating accessories in absolutely lavish manner. However it is not the cattle only that are beautified. The owners also boast of gorgeous turbans speckled with vibrant colors and impressive long moustaches. Apart from cattle the other items that are also exhibited for trading in the Nagaur Cattle Fair, Nagaur include wooden items, iron-crafts, camel leather accessories, etc. A very noted Mirchi Bazaar or Red Chili Market of India is also organized. Sports like tug-of-war, camel races, bullock races and cockfights; jugglers; puppeteers, storytellers; and exciting campfire evenings are held to entertain the tourists. Folk music of the Jodhpur variation echoes the tranquil desert sand. Nagaur is well connected to the major cities by road and rail. Nearest airport is Jodhpur, some 135 kms away.